In 1905 Vyacheslav Ivanov and Lydia Zinovieva-Annibal returned to Russia after living in Europe for many years: "We realized it’s time to be here." They became the first tenants of apartment no. 24, three relatively modest rooms in the mansard floor. The discovery of the apartment has been mythologized by Ivanov and Zinovieva-Annibal. When looking for apartments in the neighborhood of Tauride Palace, she saw an "apartments to rent" sign on a building across the street. She ascended to the top floor of the building and recognized the round room from a dream she had had while still in Geneva. In the beginning the furniture was scant, as it took time before the Ivanovs received their things from Switzerland. Thus, the exotic "Orientalist" style of the apartment – sitting on the floors covered with carpets and pillows which many memoirists recollect – was partly for practical reasons. In 1906 a neighboring apartment was annexed to that of the Ivanovs. More space was needed when their children and Maria Zamyatnina – Zinovieva-Annibal's friend who had taken care of the children – followed them from Switzerland to Petersburg. Later a third apartment was added to the two existing ones in order to accommodate the frequent visitors. In his memoirs Andrey Bely depicts the life in the Tower as of an organic entity, with the personified apartment swallowing up the neighbouring ones and becoming a collage of different forms and material objects that continued to exist in their own time and space. "...жильцы притекали; ломалися стены; квартира, глотая соседние, стала тремя, представляя сплетенье причудливейших коридориков, комнат, бездверых передних; квадратные комнаты, ромбы и секторы; коврики шаг заглушали; пропер книжных полок меж серо-бурявых коврищ, статуэток, качающихся этажерочек; эта – музеик; та – точно сараище; войдешь, – забудешь, в какой ты стране, в каком времени; все закосится; и день будет ночью, ночь – днем; даже «среды» Иванова были уже четвергами: они начинались позднее 12 ночи." 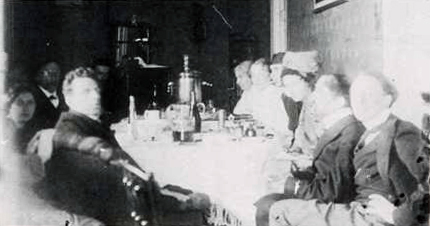 Residents and visitors of the Tower in 1910: Vsevolod Meyerhold, N. Krasnova, Vyacheslav Ivanov, V. Knyazhnin, Maria Zamyatnina, Lydia Ivanova, Sergey Sudeikin, Vera Shvarsalon (daughter of Zinovieva-Annibal, whom Ivanov later married) and Mikhail Kuzmin. Life in the Tower can be seen as a set of partially overlapping circles, exemplifying varying levels of privacy and intimacy among its inhabitants and visitors. Ivanov and Zinovieva-Annibal formed the nucleus. Its ideological extension would have been the triangular love affairs, which they sought to have first with Sergey Gorodetsky, then Margarita Sabashnikova. Its practical extension was the family unit they formed with their children and Zamyatnina. The next circle formed ideologically the meetings of the Hafiz Society (and its female equivalent Fias), which they created with their closest colleagues. In everyday life, a corresponding circle was shaped by the household, to which belonged visitors and people living in the Tower at various times. The next circle derives from the semi-public Wednesday gatherings. 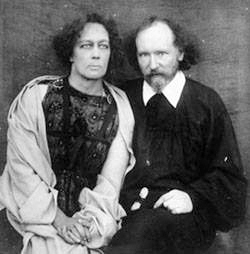 Not only the like-minded artists were invited, but Ivanov and Zinovieva-Annibal actively sought contacts with other groupings, such as realist writers. This made the Tower different from other well known literary salons of those years, although most participants of the Wednesday meetings were still members of the cultural elite. We could think of one more group of people around the Tower: the numerous admirers who came to visit Ivanov. And lastly, the public face of the Tower was shaped by the stories about it in newspapers and journals of the time. The members of the circle were not allowed to transgress the boundaries of these different "degrees" of privacy and publicity, intimacy and distance. When Sergey Auslender published an account of Hafiz in Vesy – making public something that was supposed to belong only to the chosen – he was punished by expulsion from the group. 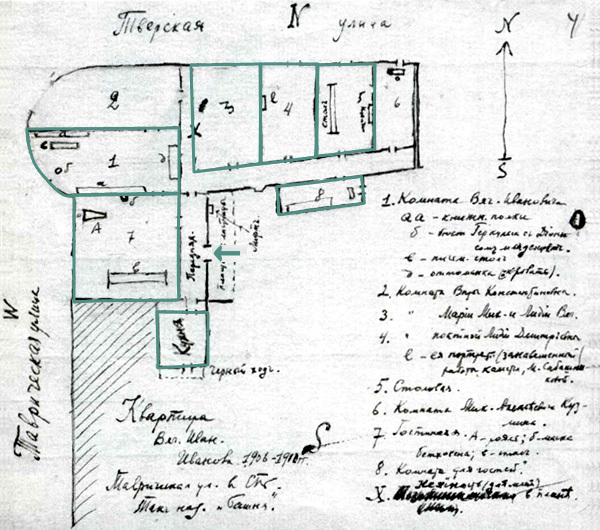 Floorplan of the Ivanov apartment drawn by one of its visitors, portraying the apartment as it was in its later years, when already two neighboring apartments had been added to the original one.